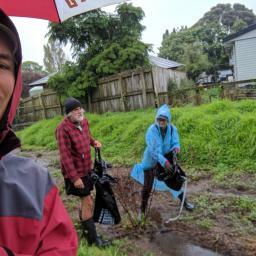 Three of us met on 29 April, and despite increasing rain, we collected rubbish on Meola Headwaters near Haverstock outfall on Kerr Taylor Park. When the rain became too much, we retired to the closest café, gumboots and all. We were delighted to be joined at Ahurangi by Alex Stone who has now been assigned to work on the Roy Clements Treeway signs – it was a novel introduction and augurs well for the signs project. Ahurangi (Meola headwaters) starts behind the new housing development on Haverstock Road, and next to Plant and Food Research. It runs past the Kura Kaupapa, and the farm, then into Kerr Taylor Park, and it needs some care! All STEPS members and supporters are invited to help. We’ll collect rubbish and maybe some pest weeds for those that know them. Come join us for just an hour or so. 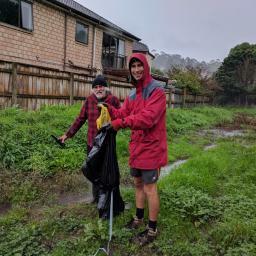 This clean up was a Neighbourly.co.nz “Great Community Clean Up” event. Thanks for the support Warehouse and Neighbourly.